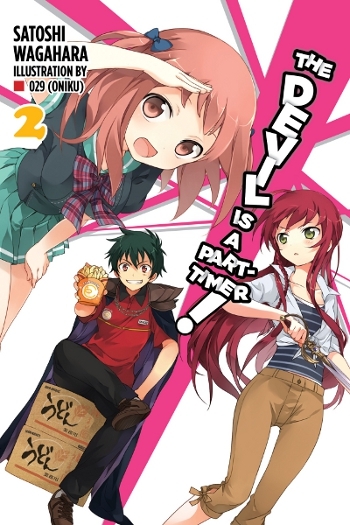 This review is for the second volume of The Devil is a Part-Timer! by Satoshi Wagahara (with art by 029 [Oniku]). The English edition was released by Yen Press in August 2015. So far there are eleven volumes available in English, and nineteen in Japanese (plus four side story volumes). It’s The Devil is a Part-Timer! — It’s great fun stuff. 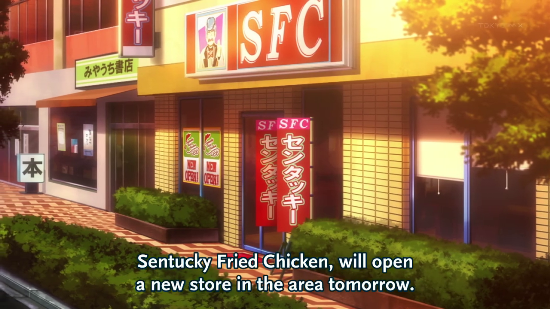 The fantasy world’s demon lord works at a hamburger restaurant, hilarity ensues. What more do I need to say? All in all volume 2 is an entertaining read, providing plenty of sitcom-esque scenarios full of misunderstandings and strong personalities. I think the series deserves extra recognition for its characters, who not only stand out on their own, but also shine in how their behavior will vary depending on who they’re interacting with. 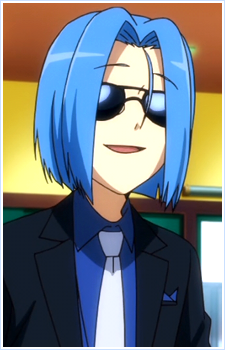 Take one of my favorite characters for example, the second-in-command demon Ashiya, AKA the househusband. The way he acts around Maou (with strictness and support) is clearly and understandably different from how he acts around Urushihara (with disdain and grouchiness), and so on for characters like Emi (with malice) or newcomer Suzuno (with cordiality). It sounds simple and obvious, but many stories don’t make that full effort. Speaking of Suzuno though, she’s actually another favorite character of mine (and it’s not just because I like kimonos). Her role as a kind of third party or uncertain wild card in the events that ensue certainly makes things more interesting, but her uniqueness also extends to her serious yet cordial personality–and in turn her polite, old-fashioned, and diplomatic manner of speech (which again, the translator pulled off fantastically). She’s a great addition to the cast, and I hope (and really, expect) that future volumes can continue to develop her character alongside all the others. In this volume, there are perhaps three main conflicts, and the story takes its time bringing them all together. A mysterious new neighbor moves in to the same apartment building as the demons, Maou must deal with a new fast food rival (“Sentucky Fried Chicken“) being run by an odd individual, and otherworldly trouble is afoot when Emi is attacked by a masked figure. The identities of various characters are not what I’d call big reveals (and really, finding out “what happens next” isn’t exactly the draw here in general), but in true Part-Timer! fashion, fantasy adventure tropes are played with in ways that manage to both flesh out the characters and amuse the reader simultaneously. If there is one thing I will find complaint for, it’s that the story unfolds at a very deliberate pace. I get that we don’t need exciting things happening non-stop, but this volume moves at a pace I would liken to a lengthy visual novel. This may just be a matter of preference, but I generally like things to be a bit snappier in a comedy. I also have to wonder if a series like this can remain entertaining while continuing to bend over backward in maintaining its shaky status quo for so long. I suppose I’ll find out for myself if the running gags can remain fresh in subsequent volumes, but for now I look forward to jumping into new material that wasn’t covered in the 2013 anime adaptation. Hey Cho. This => ” I also have to wonder if a series like this can remain entertaining while continuing to bend over backward in maintaining its shaky status quo for so long.” I had exactly the same thought when I finished volume 2. I’ve only read up to volume 3, but I can share with you that the author has come up with a smart way of keeping the balance. Also, volume 3 introduces a more serious side to the story with some background for Maho and why he is the way he is (not really that bad of a villain). To be honest, I think volume 3 was the one that sold me the series, not because of the plot of that particular book (which is fun but not fresh or original), but rather because of the backstory and world building it does. That’s great to hear, thanks for commenting. I don’t know when I’ll get to volume 3, but I’ll try to be a little quicker about it than I was for volume 2. Getting into new material should be good motivation at least. For a comedy series, Part-Timer seems to have some pretty fleshed-out world-building. But perhaps that shouldn’t be surprising, when it’s clear the author has put a lot of thought into each of the characters.